O.P. Solaiyamma, 45, lives in a shack on Barracks Road in the densely clustered business district of north Chennai, an area known as the city’s backyard. The narrow lane, which lies behind a row of tall colonial barracks now converted into a railway workshop, connects the busy wholesale market on Mint Street to Broadway, the entry point to north Chennai. Blame it on one-way streets and congested roads, but Barracks Road happens to be the easiest route for sedans and SUVs to commute between these areas. Even as we stand there speaking, cars zip by. A mother picks her child up from the road, out of the way of the wheels. Around 75 families, living in a row of shacks, battle with traffic every day. Restricted by the lasting joint and limb pains, she panicked, perhaps for the first time in her life. 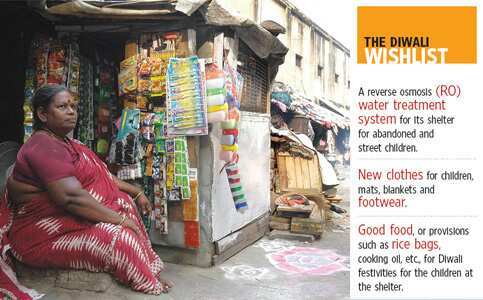 It was around this time that Karunalaya, an NGO supported by the Bonn-based Andheri-Hilfe Bonn trust and focusing on the urban poor in Chennai, started working with the “pavement dwellers", as they would be called officially, on Barracks Road. “They are called pavement dwellers irrespective of the fact that there is no pavement in any of our streets to begin with, and that all the families here have built compact mud houses in the tiny square of land that they’ve lived in for decades," says Karunalaya director Paul Sundersingh. Going by the organization’s philosophy of “teaching them to fish rather than feeding them fish", the NGO initiated the setting up of kuzhus or self-help groups among the women on Barracks Road. Solaiyamma, as one of the women looking for employment, quickly became part of one, and made a business plan to set up a petty shop in front of her house in 2002. “I borrowed Rs2,000 from the kuzhu and Karunalaya (both work independently) gave me Rs3,000. With a capital of Rs5,000, I was on my feet again," Solaiyamma says, handling customers—all of them her neighbours—at the stall where she sells packets of chips, chocolates, pens, ground masala, toothbrushes, notebooks and pencils, all roughly at a profit of Rs2 a dozen. While Karunalaya’s contribution was a grant, she repaid the loan from her kuzhu within 20 weeks. Besides livelihood and education, Karunalaya also tries to teach families to fight for their rights. “The government should be obligated to provide for and protect pavement dwellers the most, instead of ousting them as encroachers," Sundersingh says. The families got together to form a Pavement Dwellers Rights Association (PDRA) for the area in 2007, with each of the 70 families on Barracks Road represented by a member. The organization began getting support from pavement and slum dwellers in other areas as well, and was registered as a social service society with 2,500 members last year. Solaiyamma was one of the earliest members of this non-hierarchical people’s organization. Most recently, PDRA has been protesting a planned eviction to make way for road widening. “Last month, an SUV sped down this road in the night and ran over some people sleeping on the roadside. Their houses are small and can’t accommodate all the members of the family, after all," says E. Renuka, a PDRA member. “Instead of redirecting the automobiles, we have been issued eviction notices and resettlement options at the outskirts in south Chennai. Where would we work there, a place which has gleaming glass buildings but no busy markets and small traders?" Solaiyamma, in a bright red sari, and a large round bindi on her forehead, takes over, “See, our houses have been given proper addresses, following which we got ration cards and voter IDs. We have metered electricity—through persistent petitioning of our ward councillor—and we get water every morning at the street pump. Why should we be evicted?"